Canada has the world's fifth largest artificial intelligence workforce, but is still far from closing the gender gap and, for the second consecutive year, is 16th overall across all sectors in rankings compiled by World Economic Forum in its Global Gender Gap Report 2018. Canada has the world's fifth largest artificial intelligence workforce, but is still far from closing the gender gap in the sector and others, according to new rankings from the World Economic Forum (WEF). Aside from its announcements about the AI workforce, the WEF also revealed Monday that Canada ranked 16th in its annual gender gap ranking. It marks the second year Canada has placed 16th on the international organization's list, which measures economic, educational, health and political disparities experienced between men and women in more than 100 countries. Iceland, Norway, Sweden and Finland took the top spots, but Canada ranked above Latvia, Bulgaria, South Africa, Switzerland and dozens of other countries, according to the "Global Gender Gap Report 2018." When it comes to wage equality for similar work, Canada ranked 50th, behind the U.S., Germany, Thailand, Uganda and Ukraine. Iceland was first. The WEF said that this year, the global gender gap closed slightly after widening last year, for the first time in a decade. The organization calculates it will take 108 years to close the gender gap across politics, work, health and education, but 202 years to close the workplace gender gap. The international organization used LinkedIn data to find the size of Canada's AI workforce is lagging behind the U.S., India, Germany and Switzerland, but beating dozens of countries including France, Spain, Singapore and Sweden. However, the WEF found as part of its annual rankings on gender disparities that women only make up 24 per cent of Canada's AI workforce and 22 per cent of the world's AI workforce. The WEF said the lack of women in Canada and the global AI pool is troubling because it implies that technology is being developed without diverse talent, thus "limiting its innovation and inclusive capacity." Low integration of women in AI talent pools, it said, is a "significant missed opportunity in a professional domain where there is already insufficient supply of adequately qualified labour." If not addressed soon, the WEF warned, the gap could widen further. Sarah Kaplan, director of the University of Toronto's Institute for Gender and the Economy, said Canada needs to do more to develop the diversity of the AI workforce because the technology has the potential to replace lots of human processes and decisions. "If we don't have a diverse workforce working in AI, we risk not only perpetuating existing biases, but actually amplifying them and leading to really negative outcomes for the most vulnerable people in our society," she said. "We need to make a really huge deal out of the fact that we are not bringing a diverse workforce to work on this technology, which may shape all of our lives." Diversity, she added, is important because whoever designs AI technologies will decide how the systems act. A wider talent pool can help mitigate situations that society has already encountered, such as where some facial recognition systems were developed without the availability to recognize black faces. "No one ever thought 'does this work on someone other than a Caucasian person?'' Kaplan said. "The fact that we have an AI technology developed by a non-diverse workforce is hugely problematic." Kaplan said she has grown tired of seeing AI firms treat diversity as an "afterthought" and wishes it was being taken more seriously so Canada's gender gap would be much better than the global average. However, the WEF did find at least one positive when it comes to Canada's AI sector: the AI sector employs more women as a percentage of workforce than the four countries — the U.S., India, Germany and Switzerland — that rank above Canada in terms of AI workforce size. Jodie Wallis, managing director for consulting firm Accenture's AI department in Canada, said she felt encouraged by the size of the country's AI sector and the handful of women she sees in the country in high-profile AI jobs. Women, she pointed out, are running Facebook's AI research lab in Montreal and Uber's self-driving car efforts in Toronto, and contributing to Google's DeepMind unit. "Women don't have to look up and think, 'Gee, I don't think I am going to go into this field because we don't have any winners,"' said Wallis. "That is one thing we have going for us." 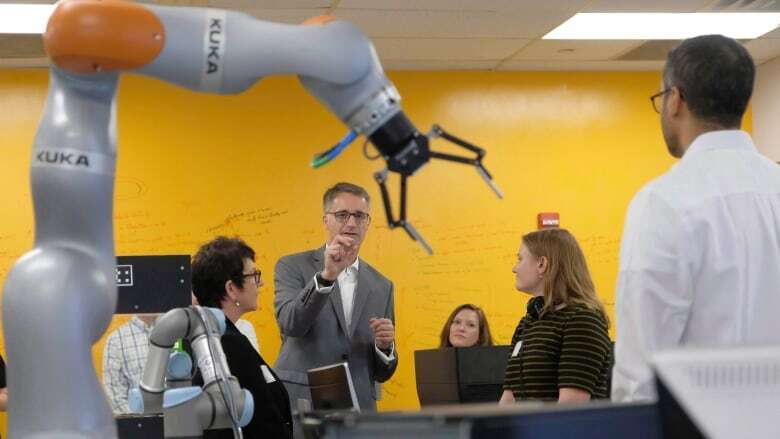 Despite the country's successes in AI, Wallis said Canada still needs to get better at scaling its technology and focusing on the enrolment of women in technology-related courses.